Nearly 50 athletes were accepted to take part in a WWE tryout this week in Chile, including a veteran of the ring and one competitor from the Mae Young Classic. 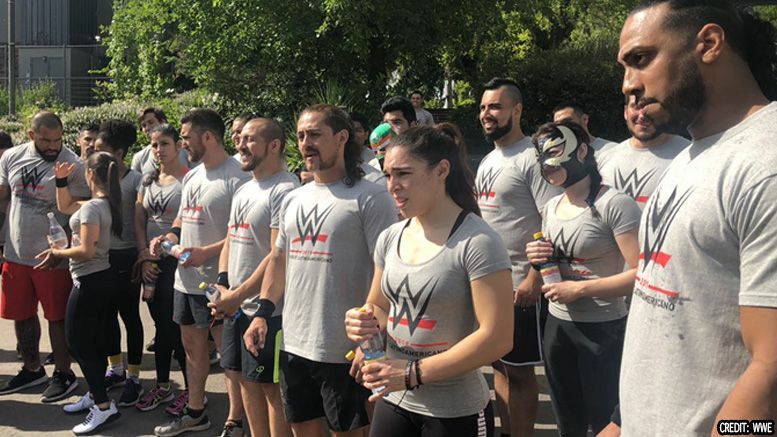 The tryout, WWE’s first to be held in Chile, drew applications from throughout the Americas, and nearly 50 athletes were accepted. Prospects hail from Chile, Costa Rica, Brazil, Peru, Mexico, Argentina, Ecuador and Puerto Rico. In addition to both up-and-coming and seasoned luchadores, the camp consists of men and women with backgrounds in Jiu-Jitsu, amateur wrestling, Muay Thai boxing, judo, taekwondo, capoeira, volleyball, football and powerlifting. The tryout is being overseen by Matt Bloom with assistance from Robbie Brookside, Sara Stock, NXT wrestlers Adrian Jaoude, Cezar Bononi and Taynara Conti (all of whom were recruited from Brazil), Raul Mendoza and NXT referee Eddie Orengo. Tayane Porfirio de Araújo, a multi-time world champion in Brazilian Jiu-Jitsu. The 23-year-old Brazilian is one of the most recognizable and decorated grapplers in the sport, having claimed the Double Grand Slam (the World, Pan American, European and Brazilian National championships) in both her weight and the absolute divisions. Renowned high-flyer Ricky Marvin, a 23-year ring veteran from Mexico who has competed in Europe, Asia, and throughout North and South America. He has held championships in Mexico’s AAA and CMLL, as well as Japan’s Pro Wrestling NOAH. Manuel Alejandro Saez, who represented Chile in the 2016 WWE Cruiserweight Classic, facing Gran Metalik in the First Round. Saez also oversees the Santiago-based 5 Luchas Clandestino promotion. 6-foot-tall, 242-pound Chilean wrestler Ariki Toa. With 11 years of experience, Toa has crossed paths with the likes of Super Crazy and reigning NXT Tag Team Champion Roderick Strong. Patricia Maria Fontes Santos, a ballerina-turned Jiu-Jitsu fighter who hails from Brazil. The 28-year-old is a three-time World No-Gi Champion. Stephanie Vaquer, who moved from Chile to Veracruz, Mexico, at age 19 to learn how to wrestle. Since then, she has fought in the U.S. and Japan. The 25-year-old also has experience in taekwondo. 18-year-old daredevil Dragon Bane, the current King of the Air Champion for Mexico’s International Wrestling Revolution Group. Mae Young Classic alumna Zatara, from Santiago. The masked wrestler battled Tegan Nox in the first round of this year’s tournament. 26-year-old wrestler Diego Valdes, who has won championships throughout Chile under the ring alias Alex Hero. Valdes began training in 2011 and made his professional debut in 2013. 23-year-old luchadora Keyra. In addition to capturing titles in Mexico, Keyra has wrestled WWE Performance Center recruits Chelsea Green and Lacey Lane. Pedro Sanchez, a street-workout athlete who has competed in events in his native Chile and Kazakhstan and trains in boxing. WWE also confirmed another tryout will be taking place early next year in Mumbai, India.